Getting out the door — for most of us, it’s the first project we tackle every day. And what a project it can be! Rushing around, frantically searching for lost keys and permission slips, hurling food into lunchboxes, and inhaling your breakfast as you run to the car. But what if you could transform your mornings? What if you could ease your way into your day, feel confident that you have all your belongings, and breeze out the door right on time? Set yourself up for success the night before. The #1 ingredient for success in your morning routine is a great bedtime routine put into practice the night before. Setting the table for breakfast or getting out your kids’ favorite cereals. Packing the lunchboxes or just prepping the food that you’ll throw into the boxes in the morning. Having your kids pick out their clothes. Packing your briefcase and the kids’ school bags with all the necessities. Reviewing your day and planning out the next day. Be realistic about your wake-up time. Some “experts” insist that, in order to have a productive morning, you need to wake up before sunrise — sometimes way before sunrise. And for some people, that’s the best option! If you’re a morning person, if you try to match your sleep schedule to you baby’s or toddler’s, or if you just love crawling into bed by 9 P.M., getting up at 4 or 5 in the morning might be just the ticket! 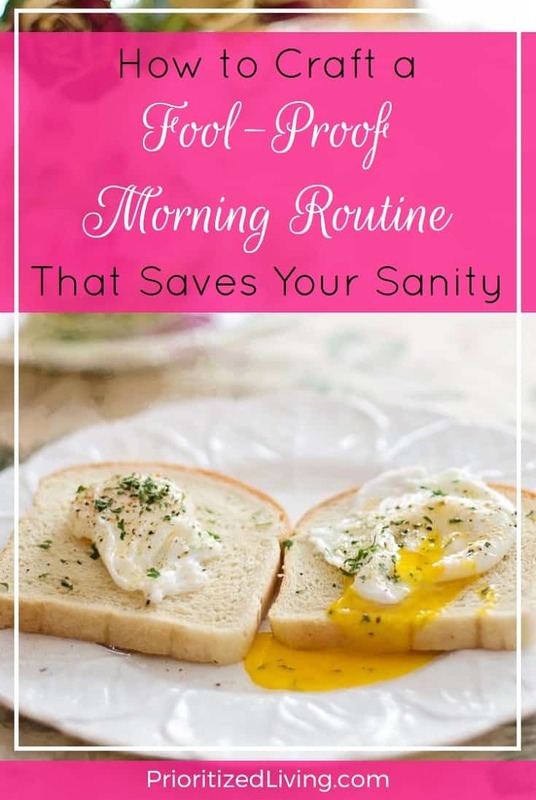 But having a fool-proof morning routine doesn’t necessarily mean dragging yourself out of bed at the crack of dawn just to fall asleep on your morning paper. Give yourself a break if you can’t or don’t want to get up early! Experiment with your bedtime and wake-up time to find the combination that gets you enough sleep and allows you to be productive and happy in the morning. Now it’s time to tailor your morning routine to your needs. Grab a piece of paper and jot down every single thing you need to accomplish on a typical morning. 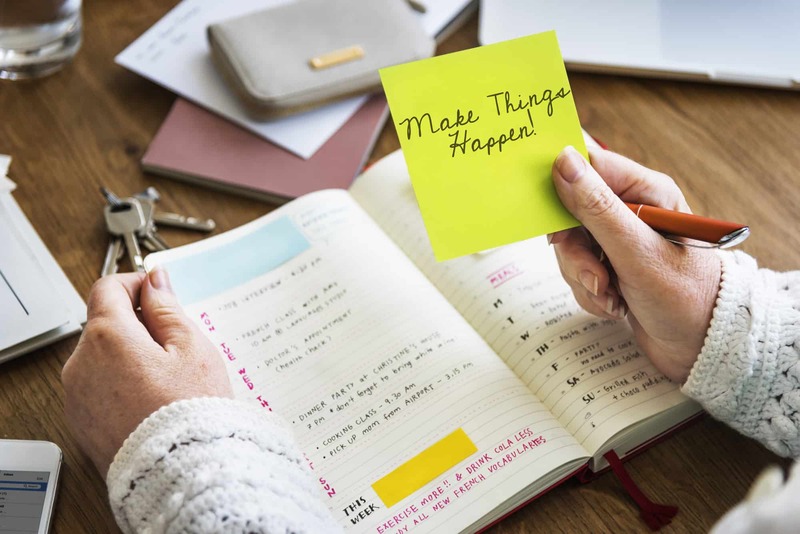 Do this exercise twice if you want to plan your weekdays and your weekends separately, or if your Mondays and Tuesdays look dramatically different from your Wednesdays through Fridays. 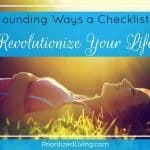 Making your bed, stacking the dishes, and tidying up. Making a pot of coffee. Writing down a plan for your day. Reading, writing in a journal, praying or meditating. Feeding and dressing your kids. Walking your kids to the bus stop or dropping them off at day care. Reading the news, your E-mails, or your favorite blogs. Drinking a big glass of water. Opening the curtains and locking the doors. Dropping your outgoing mail in the mailbox. Checking your kids’ bags to make sure they have everything they need. Having a conversation with each of your kids and your spouse. Giving yourself a pep talk in the mirror! 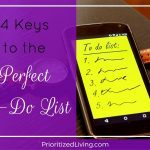 Once you round out your list of morning activities, it’s time to assign a realistic time estimate to each one. Add it all up, and work backwards from your desired morning departure time (or getting-to-the-office time) to figure out your wake-up time. Don’t forget to add in a buffer to handle those morning surprises! 6:00 A.M. Wake up. Get dressed. Do hair & make-up. 6:30 A.M. Open the curtains. check E-mail. Review the day’s tasks and activities in planner. 6:45 A.M. Wake up kids and dress them. 7:00 A.M. Eat breakfast together. 7:20 A.M. Brush teeth. Put on shoes and coats. Pack up the car. 7:30 A.M. Head out the door. 7:40 A.M. Drop kids off at school. 8:00 A.M. Arrive at the office. 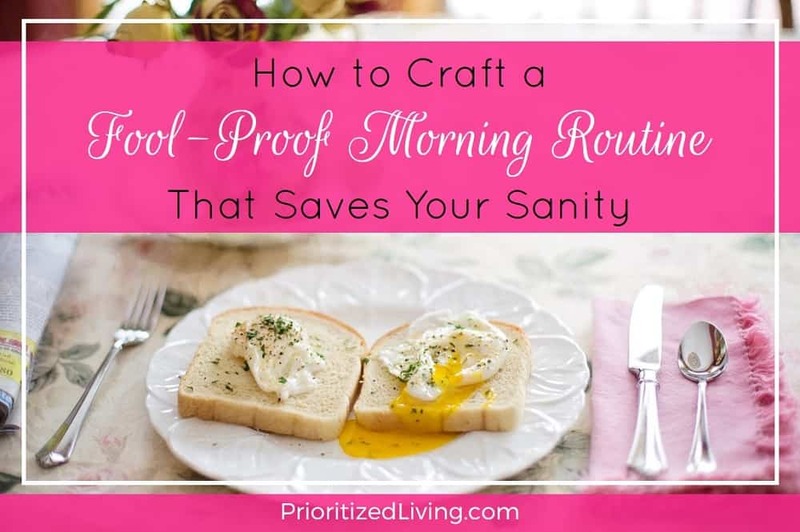 Creating the best morning routine for yourself involves a bit of trial and error. So try out your plan and tweak it as needed. 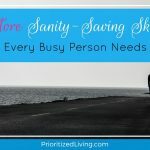 Don’t forget: Some days will be crazy or unpredictable and will defy any planning you can do. But, if your routine works most of the time, it’s probably a keeper! Once you go through the motions of your morning routine a handful of times, it’ll start to become second nature. And that’s where the magic of a morning routine kicks in. Instead of functioning reactively each day, you’re working proactively with the plan you’ve already put into place. Instead of relying on your sleepy self to assess each morning anew, you’re following a routine that your conscious, unrushed self created specifically for you. 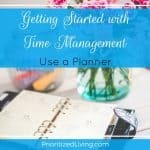 You start your day off organized, productive, and ready to go from the moment your feet hit the floor next to your bed. Best of all, you’ve set yourself up for a day of success! How has implementing a morning routine changed your whole day?